OMG you guys. I don’t have any Halloween plans this year! You know what that mean? NO plans for a costume! Eek! I mean this may break a 32-year-old tradition! I can’t even think of the last time I didn’t dress up! And I’m the girl with an arsenal of costume ideas in a secret folder! I have faith that my readers are cooler than me, so I’ll still share my annual list of Halloween ideas with you all! · What The Fox Say: This would fantastic for a group theme. One person is a fox, and the rest are the animals. Bonus points for learning the dance moves! · Amanda Bynes: Sorry – I know there are some sensitivities here because this kinda deals with mental illness, but once I saw her in court earlier this year with that blonde wig, I knew this would make it on my Halloween list. · Sharknado: The best-worst made-for-TV movie of the year. Tornado costume with sharks. 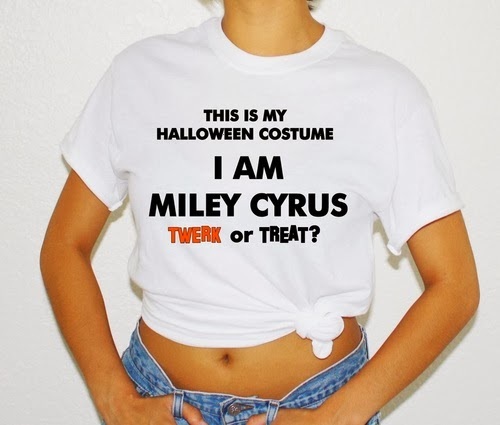 · Miley Cyrus: I should say DO NOT do this one – it’s too obvious. Add a Robin Thicke in a striped suit for an MTV Music Awards couple costume. · Government Shutdown: Park rangers, zoo keepers, congressmen…dress as your favorite employee put out of work. · Rubber Duck: If you live in Pittsburgh, this would be a hit. · #TBT: Throwback Thursday – be a picture of yourself from a yesteryear! · Royal Baby: Diaper. Crown. Enough said. Oh and I didn’t want to mention this because I hate Kim K, but baby North West is a potential idea. · Catfishing: Based on the popularity of the show and the Manti Te’o scandal earlier this year, a little pun costume could be a cat with a fishing rod!